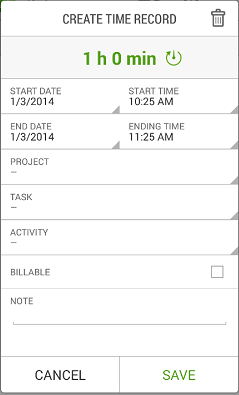 A) Create a Time Record: You can create a time record manually by pressing the track time button . Once the “create time record” window is shown, you will be able to select the information for the tracked time. Finally press on the Save button. C) Delete a Time Record: You can delete a time record either while creating or editing it. Just press the delete button located on the top-right side of the window. 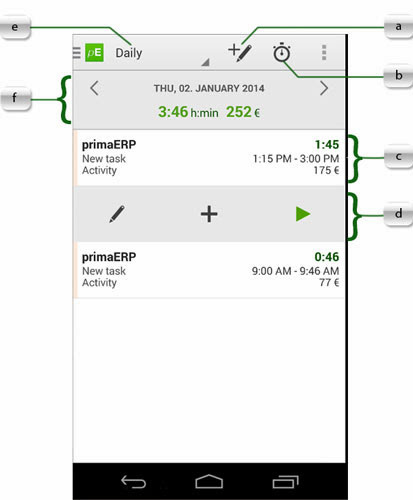 Start and End Date and Time: Informs the duration of the time spent. You can change it by touching the respective field. You can also change the duration of the time record by pressing on the duration button . 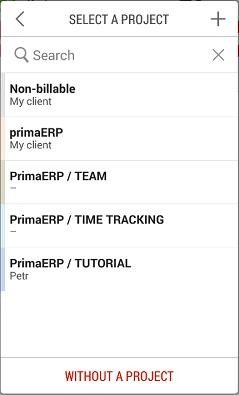 Task: Assigns a task to the time record: Just touch the Task field and select one from the list. 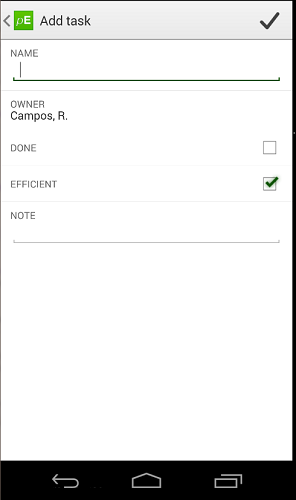 In case your Task is not listed, you can add a new Task. Note that you cannot create a task without a project. Activity: Assigns an Activity to the time record. We would like to remind that the activities are types of actions, which may be attributed to every time record and assign a price to your work. To assign an Activity to the time record, just press on the Activity field and select one from the list. A) Start the Stopwatch: You can start the stopwatch by pressing in the stopwatch button . Once the “Stopwatch” windows is shown, you will be able to fill in the information of the work to be tracked. Finally press OK to save the time record. C) Stop the Stopwatch: Press the stop button . By this action, a time record will be created. Next just press on the “save” button. D) Delete the Stopwatch: Press the stop button , and then press the delete button . You can also add some time to the stopwatch by pressing on the add time button . 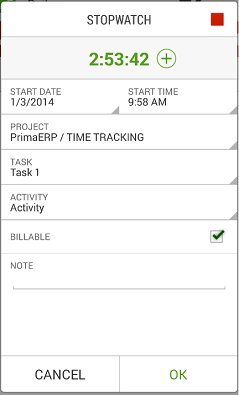 To assign a project to the time record, just press on the project field and select one from the list. In case your project is not listed, you can add a new Project. 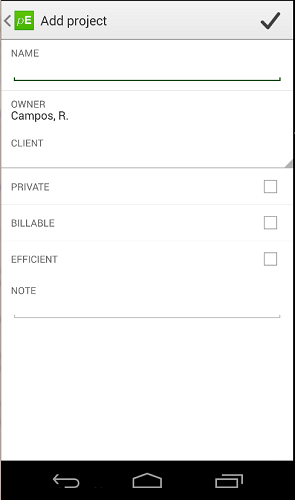 To assign a task to the time record, just press on the Task field and select one from the list. 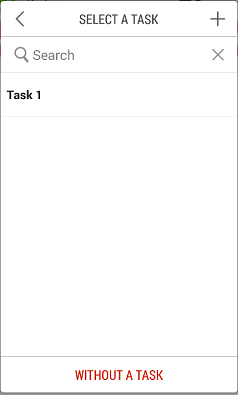 In case your Task is not listed, you can add a new Task. We would like to remind that the activities are types of actions, which may be attributed to every time record and assign a price to your work. 4. 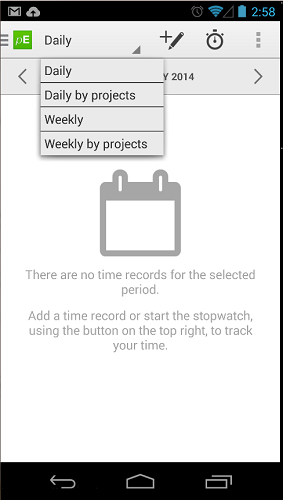 Add a new Project: You can add a new project either while creating or editing a time record or a stopwatch. a. On the time record or stopwatch window, press on the Project field. b. You will see the list of available projects. c. Press the add button . e. Press the save button , located on the top-right, to save it.